The book content below is available in paperback & printable downloads at a low donation level price. The latest edition has been extensively revised (updated) beyond this online first edition. 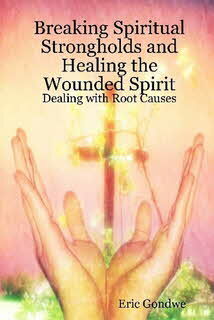 The book is titled: Breaking Spiritual Strongholds and Healing the Wounded Spirit: Dealing with Root Causes. Links are provided for its bookstores. The following is a list of cognitive biases compiled by Wikipedia, an online encyclopedia. You’ll be amazed at the long list of biases that we can sometimes nurture. The list is by no means comprehensive of all biases. The challenge to each of us is to limit the biases as much as possible in our own lives. Extreme aversion — the tendency to avoid extremes, being more likely to choose an option if it is the intermediate choice. Framing — by using a too narrow approach or description of the situation or issue. Irrational escalation — the tendency to make irrational decisions based upon rational decisions in the past or to justify actions already taken. Loss aversion — "the disutility of giving up an object is greater than the utility associated with acquiring it". (see also sunk cost effects and Endowment effect). Need for closure — the need to reach a veredict in important matters; to have an answer and to escape the feeling of doubt and uncertainty. The personal context (time or social pressure) might increase this bias. Reactance - the urge to do the opposite of what someone wants you to do out of a need to resist a perceived attempt to constrain your freedom of choice. Many of these biases are often studied for how they affect business and economic decisions and how they affect experimental research. Ambiguity effect — the avoidance of options for which missing information makes the probability seem "unknown". Anchoring — the tendency to rely too heavily, or "anchor," on a past reference or on one trait or piece of information when making decisions. Anthropic bias — the tendency for one's evidence to be biased by observation selection effects. Attentional bias — neglect of relevant data when making judgments of a correlation or association. Availability heuristic — a biased prediction, due to the tendency to focus on the most salient and emotionally-charged outcome. Clustering illusion — the tendency to see patterns where actually none exist. Conjunction fallacy — the tendency to assume that specific conditions are more probable than general ones. Gambler's fallacy — the tendency to assume that individual random events are influenced by previous random events. For example, "I've flipped heads with this coin five times consecutively, so the chance of tails coming out on the sixth flip is much greater than heads." Hindsight bias — sometimes called the "I-knew-it-all-along" effect, the inclination to see past events as being predictable. Illusory correlation — beliefs that inaccurately suppose a relationship between a certain type of action and an effect. Ludic fallacy — the analysis of chance related problems with the narrow frame of games. Ignoring the complexity of reality, and the non- gaussian distribution of many things. Neglect of prior base rates effect — the tendency to fail to incorporate prior known probabilities which are pertinent to the decision at hand. Observer-expectancy effect — when a researcher expects a given result and therefore unconsciously manipulates an experiment or misinterprets data in order to find it (see also subject-expectancy effect). Optimism bias — the systematic tendency to be over-optimistic about the outcome of planned actions. Overconfidence effect — the tendency to overestimate one's own abilities. Positive outcome bias — a tendency in prediction to overestimate the probability of good things happening to them (see also wishful thinking, optimism bias and valence effect). Primacy effect — the tendency to weigh initial events more than subsequent events. Recency effect — the tendency to weigh recent events more than earlier events (see also peak-end rule). Regression toward the mean disregarded — the tendency to expect extreme performance to continue. Reminiscence bump — the effect that people tend to recall more personal events from adolescence and early adulthood than from other lifetime periods. Rosy retrospection — the tendency to rate past events more positively than they had actually rated them when the event occurred. Stereotyping — expecting a member of a group to have certain characteristics without having actual information about that individual. Subadditivity effect — the tendency to judge probability of the whole to be less than the probabilities of the parts. Telescoping effect — the effect that recent events appear to have occurred more remotely and remote events appear to have occurred more recently. Texas sharpshooter fallacy — the fallacy of selecting or adjusting a hypothesis after the data are collected, making it impossible to test the hypothesis fairly. Hawthorne effect — refers to a phenomenon which is thought to occur when people observed during a research study temporarily change their behavior or performance (this can also be referred to as demand characteristics). Actor-observer bias — the tendency for explanations for other individual's behaviors to overemphasize the influence of their personality and underemphasize the influence of their situation. This is coupled with the opposite tendency for the self in that one's explanations for their own behaviors overemphasize their situation and underemphasize the influence of their personality. (see also fundamental attribution error). Dunning-Kruger effect — "...when people are incompetent in the strategies they adopt to achieve success and satisfaction, they suffer a dual burden: Not only do they reach erroneous conclusions and make unfortunate choices, but their incompetence robs them of the ability to realize it. Instead, ...they are left with the mistaken impression that they are doing just fine. "(see also Lake Wobegon effect, and overconfidence effect ). Egocentric bias — occurs when people claim more responsibility for themselves for the results of a joint action than an outside observer would. Forer effect (aka Barnum Effect) — the tendency to give high accuracy ratings to descriptions of their personality that supposedly are tailored specifically for them, but are in fact vague and general enough to apply to a wide range of people. For example, horoscopes. False consensus effect — the tendency for people to overestimate the degree to which others agree with them. Fundamental attribution error — the tendency for people to over-emphasize personality-based explanations for behaviors observed in others while under-emphasizing the role and power of situational influences on the same behavior (see also actor-observer bias, group attribution error, positivity effect, and negativity effect). Halo effect — the tendency for a person's positive or negative traits to "spill over" from one area of their personality to another in others' perceptions of them (see also physical attractiveness stereotype). Herd instinct Common tendency to adopt the opinions and follow the behaviors of the majority to feel safer and to avoid conflict. Illusion of asymmetric insight — people perceive their knowledge of their peers to surpass their peers’ knowledge of them. Illusion of transparency — people overestimate others' ability to know them, and they also overestimate their ability to know others. Ingroup bias — the tendency for people to give preferential treatment to others they perceive to be members of their own groups. Just-world phenomenon — the tendency for people to believe that the world is "just" and therefore people "get what they deserve." Lake Wobegon effect — the human tendency to report flattering beliefs about oneself and believe that one is above average (see also worse-than-average effect, and overconfidence effect ). Notational bias — a form of cultural bias in which a notation induces the appearance of a nonexistent natural law. Outgroup homogeneity bias — individuals see members of their own group as being relatively more varied than members of other groups. Projection bias — the tendency to unconsciously assume that others share the same or similar thoughts, beliefs, values, or positions. Self-serving bias — the tendency to claim more responsibility for successes than failures. It may also manifest itself as a tendency for people to evaluate ambiguous information in a way beneficial to their interests (see also group-serving bias). Self-fulfilling prophecy — the tendency to engage in behaviors that elicit results which will (consciously or not) confirm our beliefs. System justification — the tendency to defend and bolster the status quo, i.e. existing social, economic, and political arrangements tend to be preferred, and alternatives disparaged sometimes even at the expense of individual and collective self-interest. Trait ascription bias — the tendency for people to view themselves as relatively variable in terms of personality, behavior and mood while viewing others as much more predictable. Consistency bias: incorrectly remembering one's past attitudes and behaviour as resembling present attitudes and behaviour. Cryptomnesia: a form of misattribution where a memory is mistaken for imagination. Hindsight bias : filtering memory of past events through present knowledge, so that those events look more predictable than they actually were; also known as the 'I-knew-it-all-along effect'. Suggestibility: a form of misattribution where ideas suggested by a questioner are mistaken for memory. 1. (Kahneman, Knetsch, and Thaler 1991: 193) Richard Thaler coined the term "endowment effect." 2. (Kahneman, Knetsch, and Thaler 1991: 193) Daniel Kahneman, together with Amos Tversky, coined the term "loss aversion." 5. Justin Kruger; David Dunning (1999). " Unskilled and Unaware of It: How Difficulties in Recognizing One's Own Incompetence Lead to Inflated Self-Assessments ". Journal of Personality and Social Psychology 77 (6): 1121–34. PMID 10626367. Kahneman, Daniel, Jack L. Knetsch, and Richard H. Thaler. (1991). "Anomalies: The Endowment Effect, Loss Aversion, and Status Quo Bias." The Journal of Economic Perspectives 5(1):193-206. Reality is not black and white as we assume. It is colored by our own perceptions and ways of thinking. Here are some interesting quotes on reality by people in the secular world and some Christians. This is in reference to qualitative or philosophical reality which cannot be concretely measured or determined in absolute terms. This is in contrast to quantitative reality which can be concretely measured or determined in absolute terms. 1+1=2 is quantitative reality. It’s largely known as pure science. However quantitative reality has qualitative aspects in many areas. For example, some researchers claim the world is millions of years while others say it’s in thousands. Each endeavors to use quantitative methods of analysis. However because the methods of measurement have a human element in them they end up being partly qualitative. Qualitative reality is vulnerable to our own biases. The challenge is in minimizing these biases so that reality is seen in its truest sense. Below are some quotes on building a mindset and perception of reality grounded in faith and God’s Word. You’ll notice that some on faith border on positive thinking. If you’ve noticed I’m not a supporter of positive thinking in its fundamental sense. Positive thinking in its fundamental sense tries to make a person a god over his/her own life. It says you can create your own destiny and choose whatever you want to become, to have, whenever and wherever. This is not what the bible says. “A man’s life is not his own; it is not for man to direct his steps,” Jeremiah 10:23. As Christians we don’t create our own destiny and choose whatever we want to become. We seek God’s purpose to be fulfilled in our lives based on what he precisely brought us in this world for. It’s his agenda, not ours, for our lives that we’re interested in. There are people God wants to reach through each of us. People are hurting out there in different areas of their lives: spiritual, social, physical health, or material health. God wants to reach out to them through us. There are matters God wants to fulfill through each of us that may benefit later generations. We’ve countless examples, including Jesus, the apostles, church reformers throughout history, Dr Martin Luther King, and so on. Thus sometimes God’s purpose for our lives may require ultimate sacrifice of our physical lives. None of this is part of positive thinking. God’s way of reaching out to people matters most than our way of reaching out. We ask him to help us overcome mental blocks, doubts, wrong perceptions and other mental flaws so that they do not limit his work through each of us. It’s therefore hoped the following quotes will be looked at in form of faith in God not mere positive thinking. They are nuggets to help us overcome any areas of mental slavery to mental blocks, doubts, wrong perceptions and other mental flaws. They are nuggets for embracing God’s word while forsaking our own inner negative words, the words of negative circumstances, hindrances, words of people, and words of fallen angels. They help in acquiring God’s perspective on matters in life. “When one door closes another door opens; but we so often look so long and so regretfully upon the closed door, that we do not see the ones which open for us,” by Alexander Graham Bell (1847 – 1922), Scottish inventor. “What he (Jesus) opens no one can shut, and what he shuts no one can open. I know your deeds. See, I have placed before you an open door that no one can shut,” Rev 3:7-8. “You intended to harm me, but God intended it for good,” Genesis 50:20 (God opened another door from the unfortunate experience Joseph schemed by his brothers). “And we know that in all things (good and bad) God works for the good of those who love him, who have been called according to his purpose,” Romans 8:28 (emphasis added). “Jesus looked at them and said, With man this is impossible, but with God all things are possible,” Matthew 19:26. “Being confident of this, that he who began a good work in you will carry it on to completion until the day of Christ Jesus,” Phil. 1:6 (NIV). “In him we were also chosen, having been predestined according to the plan of him who works out everything in conformity with the purpose of his will,” Ephesians 1:11. “You will either step forward into growth or you will step back into safety,” by Abraham Maslow. “The big secret in life is that there is no big secret. Whatever your goal, you can get there if you’re willing to work,” by Oprah Winfrey. “Seeds of faith are always within us; sometimes it takes a crisis to nourish and encourage their growth,” Susan Taylor. “Like farmers we need to learn that we cannot sow and reap the same day,” by an unknown author (every effort we make counts –eventally). “A religion that gives nothing, costs nothing, and suffers nothing, is worth nothing,” by Martin Luther, 16th century church reformer. “May he remember all your sacrifices and accept your burnt offerings,” Psalms 20:3. “An individual has not started living until he can rise above the narrow confines of his individualistic concerns to the broader concerns of all humanity,” Martin Luther King, Jr., civil rights leader. “I consider that the sufferings of this present time are not worth comparing with the glory that is to be revealed to us,” Romans 8:18. “According to your faith will it be done to you,” Matthew 9:29. “Whether you think that you can, or that you can't, you are usually right,” by Henry Ford. “It is not my ability, but my response to God's ability, that counts,” by Corrie Ten Boom. “It always seems impossible until it’s done,” by Nelson Mandela. “First they ignore you, then they laugh at you, then they fight you, then you win,” by Mohandas Gandhi. “Strength does not come from physical capacity. It comes from an indomitable will,” by Mohandas Gandhi. “Take the first step in faith. You don't have to see the whole staircase, just take the first step,” by Martin Luther King, Jr.
“Faith is the substance of things hoped for, the evidence of things not seen,” Hebrews 11:1. “Without faith it is impossible to please God,” Hebrews 11:6. “Everything is possible for him who believes,” Mark 9:23. “Faith makes things possible, not easy,” by unknown author. “Faith can move mountains, but don't be surprised if God hands you a shovel,” by unknown author. “Faith is like radar that sees through the fog,” by Corrie Ten Boom, in Tramp for the Lord. “Reason is our soul's left hand, Faith her right,” John Donne. “To me faith means not worrying,” by John Dewey. “Faith is courage; it is creative while despair is always destructive,” by David S. Muzzey. “Feed your faith and your fears will starve to death,” unknown author. “Weave in faith and God will find the thread,” by unknown author. “Faith is putting all your eggs in God's basket, then counting your blessings before they hatch,” by Ramona C. Carroll. Again, I tell you that if two of you on earth agree about anything you ask for, it will be done for you by my Father in heaven. For where two or three come together in my name, there am I with them,” Matthew 18:19-20. “He replied, If you have faith as small as a mustard seed, you can say to this mulberry tree, 'Be uprooted and planted in the sea,' and it will obey you,” Luke 17:6.